Anyone who preordered LUNAR: Eternal Blue Complete probably knows all about the Ghaleon punching puppet, which is pictured below. But many probably don't know that there was also an Alex punching puppet planned if you bought both LUNAR: Eternal Blue Complete for the Playstation and LUNAR: Silver Star Story Complete for the PC. 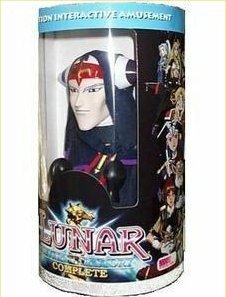 Unfortunately the PC version of LUNAR: SSSC was canned, so this Alex punching puppet will remain forever an unobtainable LUNAR item. However if you missed out on the Ghaleon punching puppet, just check EBay. They show up all the time for decent prices. Below is pictures of both the Ghaleon punching puppet and the Alex punching puppet.